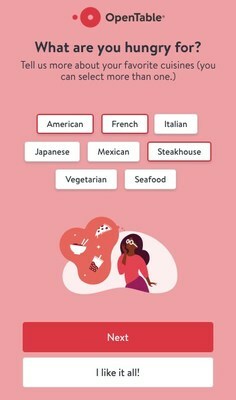 OpenTable Settles "What Do You Want to Eat?" 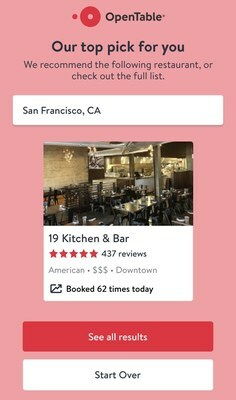 Debate This Valentine's Day | OpenTable, Inc.
SAN FRANCISCO, Feb. 6, 2019 /PRNewswire/ -- OpenTable, the world's leading provider of online restaurant reservations and part of Booking Holdings, Inc. (NASDAQ: BKNG), is adding more romance and less squabbling to Valentine's Day planning this year. 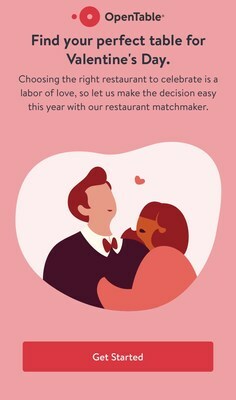 With Matchmaker, an online tool available at www.opentable.com/matchmaker, OpenTable is making it easy for diners to find and book the perfect restaurant for Valentine's Day based on a series of questions including party type and size, budget, ideal ambience and desired cuisine. 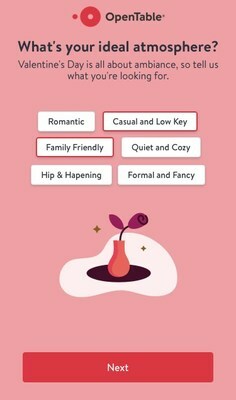 Matchmaker easily and quickly combs through relevant options to deliver top recommendations for the special occasion. Based on a recent survey*, the Matchmaker couldn't come at a better time. Deciding on what to eat is a source of anxiety for many Americans, with 1 in 2 survey participants saying they would rather do dishes than engage in an endless debate. "Valentine's Day is the biggest dining day of the year. Last year, we saw over 2 million seated diners on the holiday," said Caroline Potter, Chief Dining Officer at OpenTable. "With our Matchmaker, we want to ensure it's a joyous, carefree occasion, when people can focus efforts on being with significant others, loved ones or friends, rather than stressing over where to go or what to eat." Conveniently available via desktop, and mobile friendly, the restaurant generator takes a few seconds, quickly offering diners a series of available restaurant options to book for the big day. The secret to a lasting romantic relationship? The survey also found 50 percent of participants believe that enjoying nightly dinner and conversations is the secret sauce to going the distance. 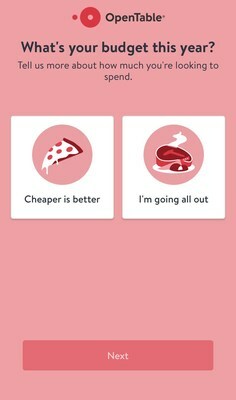 While love can be celebrated year-round, 6 in 10 agree that dining out on Valentine's Day leads to a greater chance of getting lucky compared to other nights of the year. "This underscores our belief that dining out is so much more than meets the eye," added Potter. "We are honored to play a role in such an important tradition and will always seek ways to connect diners with the perfect restaurant for every occasion." For a complete guide to a delicious Valentine's Day, go here. *This OpenTable survey of 2,000 adults in the U.S. (18 years or older) was conducted between January 2, 2019 and January 3, 2019.